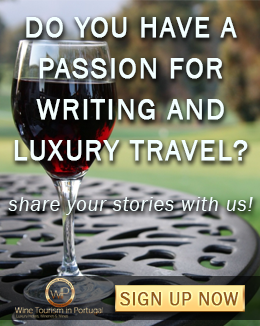 Last week we started an article where we elected the Best Hotels in Portugal by wine region. 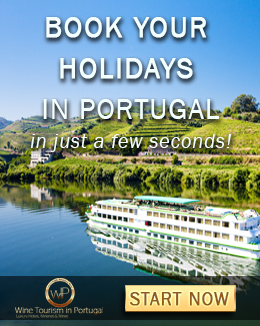 This selection purpose is to help you when the time comes to choose accommodation for your holidays in Portugal. There are so many hotels in Portugal that one can feel a bit lost when choosing a place to stay during their holidays. The last thing we want to worry about during, what it is supposed to be, a time of relaxation is if the hotel provides the best comfort conditions and services. With our carefully selected hotels, you won't have to worry about that because only the best hotels in Portugal made it to our list. In this second part of the article, we focus on the regions of Dão and Lafões, Bairrada, Beira Interior, Lisbon, Alentejo, Peninsula de Setubal, Algarve, and Madeira. The Farm and Hotel Rural Madre de Água aims to revive the arts and traditions of the region. 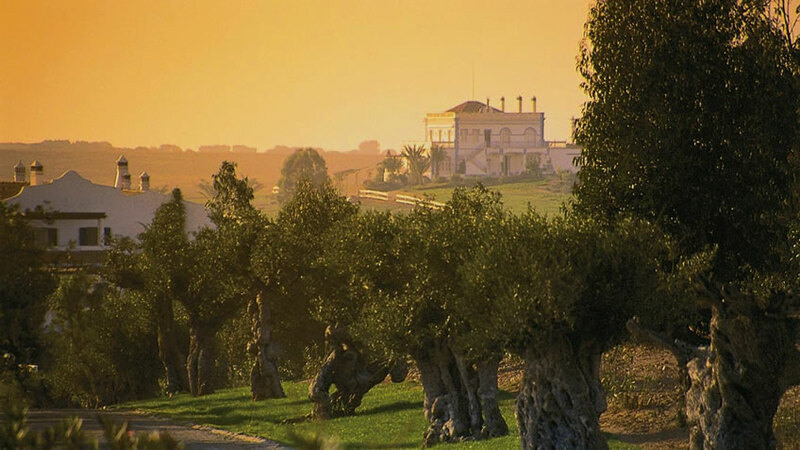 The Farm and Hotel are surrounded by a vineyard, olive grove, orchard, forest, organic garden and fields of red fruits. The construction of a cheese dairy, winery and cellar are part of the project in the short term. 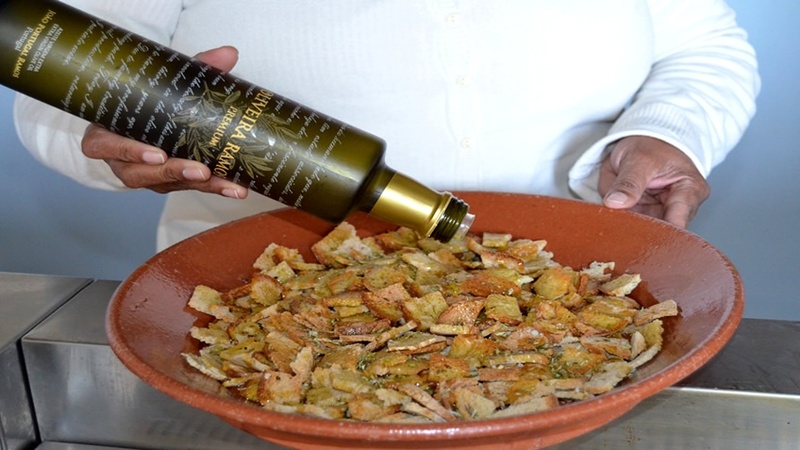 It offers very authentic experiences to its guests such as the possibility to enjoy guided tours around the farm and learn by observing and participating in the agricultural and farming activities, such as milking, shearing , adjustment of load, defoliation of the vines, harvest, olive picking, cherry picking, harvesting garden produce biological, pruning, etc. 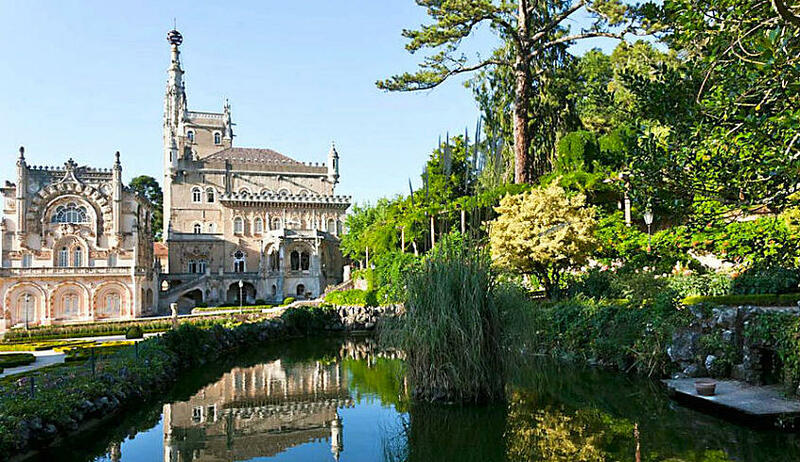 The palace is placed in Serra do Bussaco and it was built in 1885 and it was Royal palace of the last kings of Portugal. The hotel is considered one of the most beautiful, romantic and historical in the world since 1917. Located well in the interior of the National Forest of Bussaco, it's surrounded with fauna from all over the world, many of them giants, and it offers countless and unforgettable pedestrians walks in close contact with nature, with passages through breathtaking fountains, chapels, hermitages, and sights all the way through the hill. The Palace is an excellent example of "manuelino-gothic” architecture style. 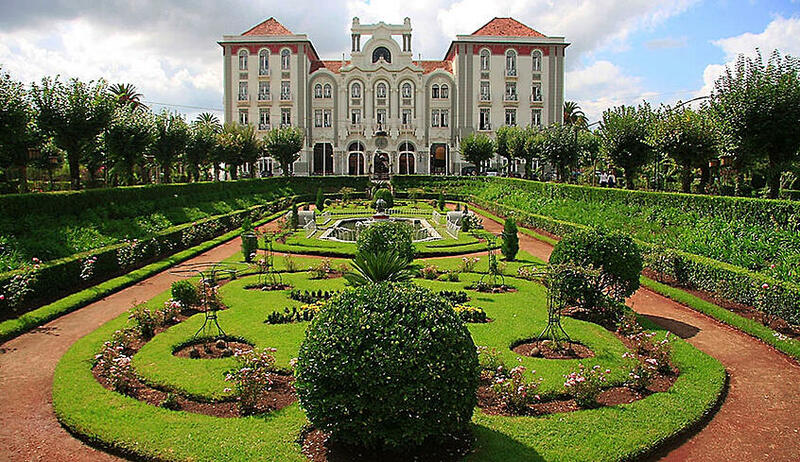 Its halls rich decor, have ancient furniture, large paintings, and typical Portuguese painted tiles. It is truly one of the most distinct hotels in the world. The Palace of Curia opened in 1926, and it was amazingly remodeled and reopened recently preserving and honoring all its mysticism classical ambience grandiosity. Surrounded by a wide private park, by vines from Bairrada and by the Golf of Curia, it’s the ideal refuge to know the Route of Wines of Bairrada region, wines with history, wine cellars and magnificent wine tourism stations. 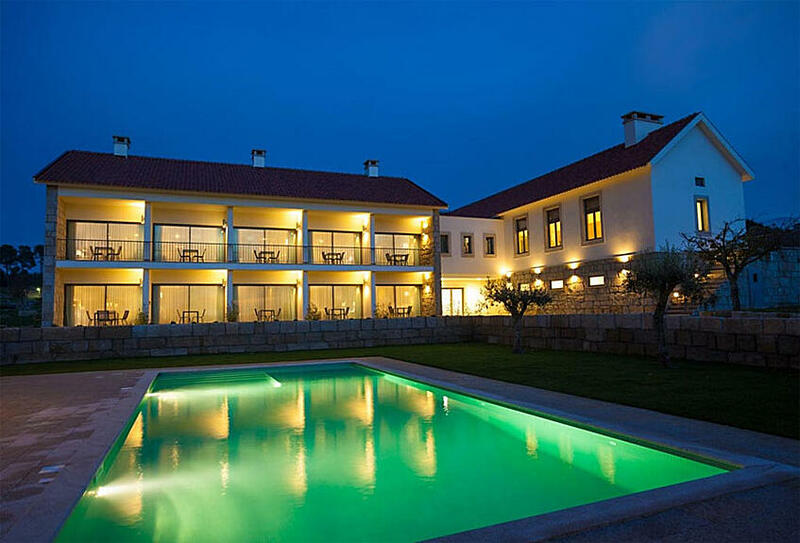 It offers luxurious accommodation, one of the main Spas in the Centre of Portugal, fascinating public areas, wine and gastronomic benefits of high quality, golf and a leisure space at open air with no pair in the country, all together with the rare natural view of an artistic beauty. 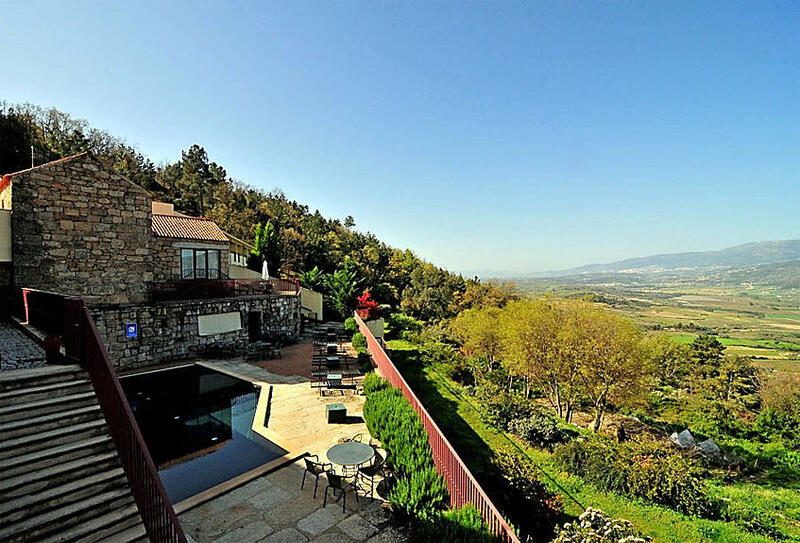 Casas do Côro is a granite appeal, just as the warmth of the region of Beira. It was built in 2000 and there is a permanent investment in new houses and complementarities. In 2004 seven new accommodation units were built, as well as a thematic Eco-Friendly SPA with healthy food. It offers several living and reading rooms. You can find there the Casão do Largo, a restaurant of traditional food where you can enjoy the best dishes that gastronomy can offer. It also has an Outdoor Space with a swimming pool and a bar for lunches, or for light dinners on summer days, and two outdoor Lunges: Refúgio das Fragas and Vinha with a biological and educational garden. The Inn Convento de Belmonte Convent was born from the ruins of the Convent Nossa Senhora da Esperança. Its parchments are as old as the history of Portugal and the image of Our Lady of Hope that accompanied Pedro Álvares Cabral on his voyage to Brazil belonged to its hermitage. Located near the Historic Village of Belmonte, Pousada Convento de Belmonte has inside an old chapel and sacristy adapted to be a living room and bar that witness the meticulous reconversion works that were carried out in the convent from 1997 and a perfect example of the harmonious coexistence between historic areas and a modern and welcoming building. Bairro Alto Hotel Lisbon located in the heart of historic downtown, between two of the most emblematic city districts, the bohemian Bairro Alto and the chic, cultural and trendy Chiado. 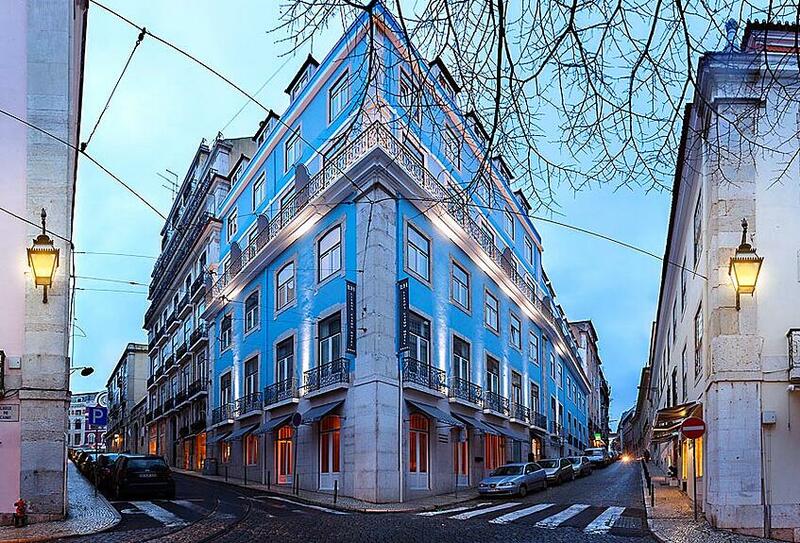 The 8th century Building, that once was the famous "Grand Hotel de L’Europe", Bairro Alto Hotel was the first five stars boutique hotel in Portugal and is now a symbol of the best, in terms of hotel business, you can find in the city of Lisbon. 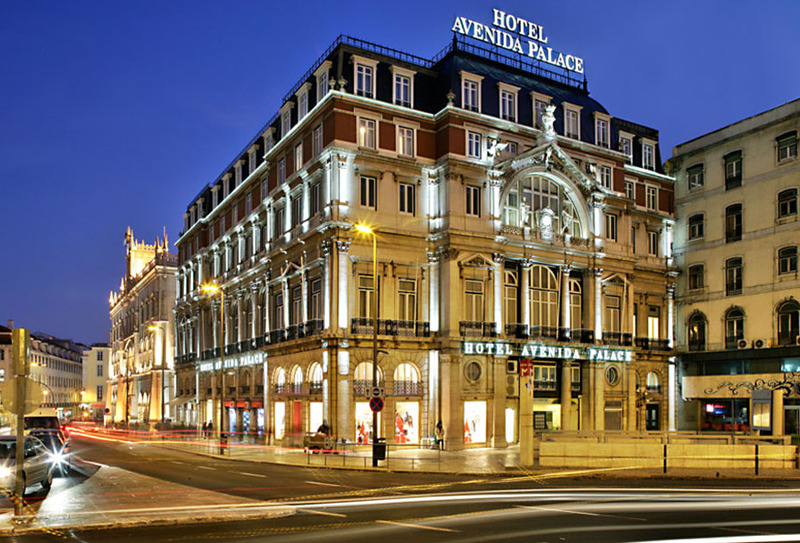 The Hotel Avenida Palace is a 5-star Hotel where luxury and a unique charm intersect. The hotel is a historical heritage of the city. With an exceptional location between the Pombalina downtown and the Liberdade Avenue, its elegant neoclassical architecture and the luxurious sophistication of its décor with over a century of history but fully renovated, this Hotel is a landmark where tradition combines with innovation. The intimate and relaxing atmosphere, the customized and exquisite service and great concern for detail transform every stay in the Avenida Palace into an unforgettable experience. The Hotel is close to fast accesses to all city zones and surrounding areas, through the major transport facilities. From the Avenida Palace discover Lisbon, its monumental and historical richness, its cultural diversity and its contrasts. Located in a baroque area of Estrela, in Lisbon, the Estrela Hotel is housed in the elegant Palace of the Counts of Paraty. Its interiors, designed by Miguel Câncio Martins (Budha Bar of Paris, Pacha of Marrakech), bring back the spirit of the ancient schools, offering an original accommodation experience. 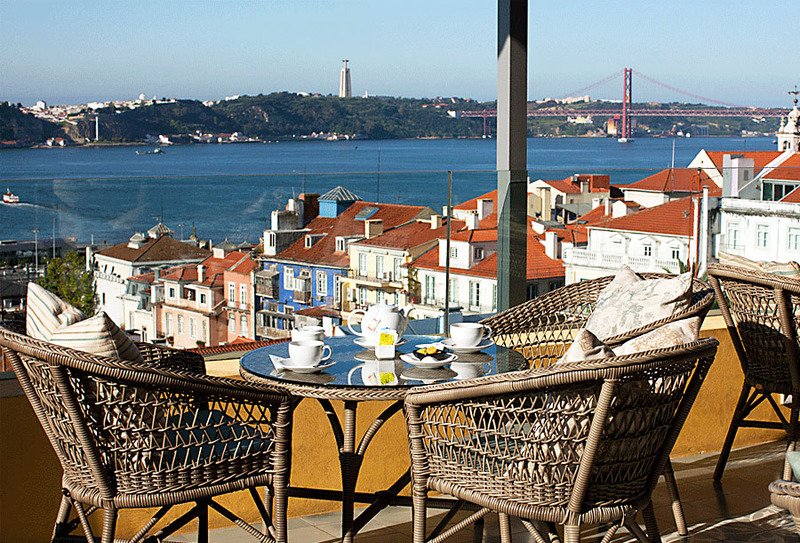 The hotel offers impressive views of the city and the river Tejo. Its ambience combines the iconography of the old schools with the modern design, the idea to relax in a bed in the garden in the middle of the city. Two suites have Hästens beds, known to be the best in the world. 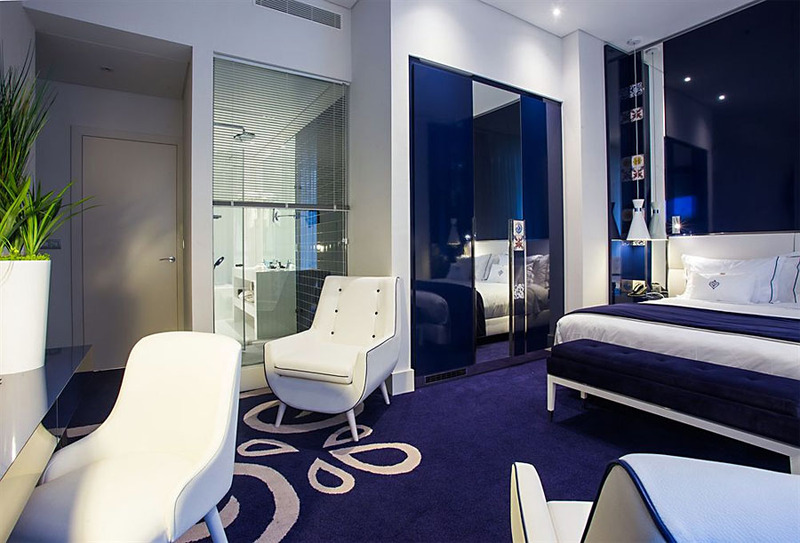 The Hotel Portugal Boutique in the downtown of Lisbon is the ideal starting point for exploring Lisbon. A few meters away from Hotel Portugal you can find several points of interest that are part of the tradition and culture of Lisbon, such as the Arch of Triumph in Augusta Street, the Rossio Square, the Chiado and the Castle of São Jorge. The hotel is in a prime location, with a large choice of public transport that will take you anywhere you want. All its rooms share the blue and white décor, designed by the award-winning interior designer Cristina Santos Silva, around Portuguese tiles, some of which can be seen in the rooms like small charming notes. It has a varied wine list and traditional Portuguese food. You can enjoy your drink in the "Deck", a typically Lisbon patio. 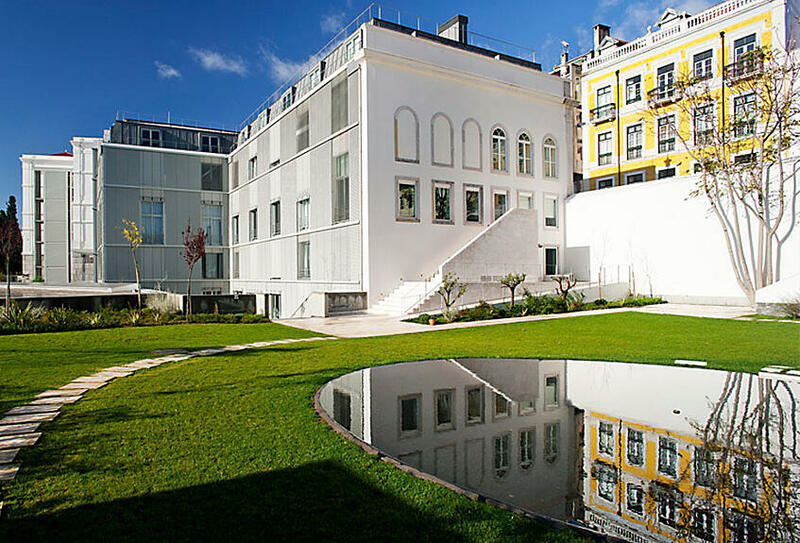 Near the Jerónimos Monastery, in the middle of the Museum & Monument District of Lisbon, Jerónimos Hotel appeals to the constant challenge of the senses with its colors and innovating lines of the delicate design. The warm colors in the interior highlight the original and relaxing design and the modern architectonic lines. Lisboa Carmo Hotel is located in the heart of Lisbon, right in the Largo do Carmo square, and is inspired by the concept of tailoring to create stays to suit each guest, where attention to detail, elegance, and warm hospitality are gathered to create unique and memorable experiences. 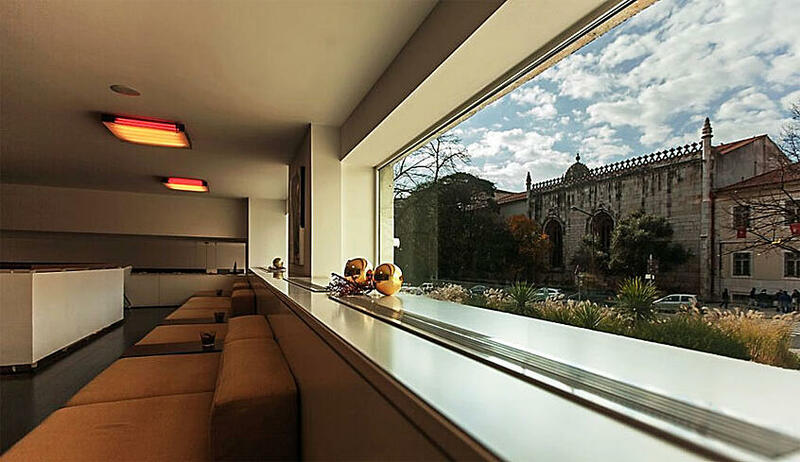 Filled with history and symbolism, the Largo do Carmo square, where the hotel is located, keeps over seven centuries of history of Lisbon in the ruins of its convent of the 14th century that proudly resisted the 1755 earthquake and time. Situated in the eastern area of Lisbon, the hotel Myriad is close to several entertainment venues, museums, restaurants, and Casino. 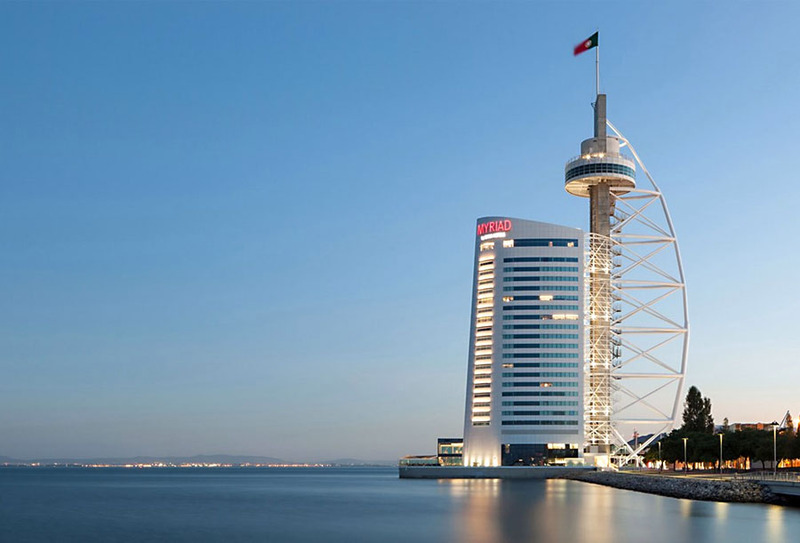 Located on the bank of the Tejo River and with boasting panoramic views, the MYRIAD is a unique and futuristic oasis that offers a luxurious and contemporary accommodation. It has a restaurant with an excellent selection of Portuguese wines, a stylish bar and an indoor swimming pool with SPA facilities and fitness. With an original and colorful décor, the rooms and suites are spacious and offer stunning views of Lisbon, the Tejo River, and Vasco da Gama Bridge. The Oitavos is the perfect destination for lovers of outdoors, culture, gastronomy, spa, and wellness. Offering a modern taste of Portugal, this hotel has achieved new standards of excellence and added the "luxury" of informality to its guest's experience, providing quality service, style and fun to a global, sophisticated audience. Located on the coastline, overlooking the Atlantic Ocean, and on the fringe of the Sintra National Park, only 5 minutes from the town of Cascais and the famous Guincho beach, The Oitavos is the ideal place from which to enjoy your authentic Portuguese adventure. 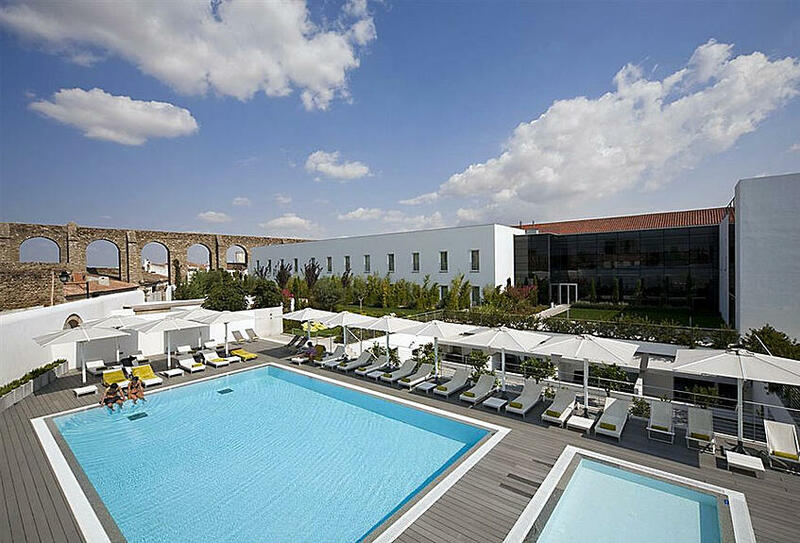 Just one hour and a half from Lisbon, in the heart of the Alentejo and set in the historic village of Vila Viçosa, the Marmòris Hotel & Spa presents itself as one the most luxurious new hotels in Portugal. It stands out for its quiet and comfortable atmosphere of genuine hospitality and for the wide range of services created to provide memorable experiences to its guests. Built in the 15th century, Convento do Espinheiro is fascinating because its history, charm and rare beauty. It has been a spot of choice through centuries by the royal family every time they moved to Évora. Luxuriously redecorated, it is considered a national monument. This Hotel is inserted in a sumptuous garden of 8 hectares. Its interior was brilliantly decorated and able to keep its historical character. They also provide several unique experiences such as a guided tour through its history, and sommelier escorted wine tastings in a Gothic Cellar. Herdade da Malhadinha Nova is located in Albernoa, in the heart of Baixo Alentejo and offers comfort and design in a perfect harmony between Nature and the surrounding Landscape. Its concept is based on offering experiences wrapped in the theme of wine, as well as Wine Tourism, Hotel, and Restaurant. 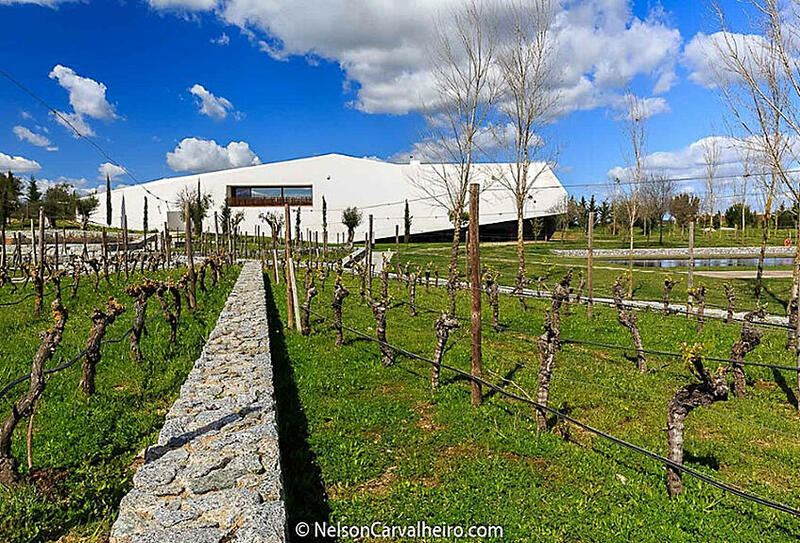 The enotourism experiences and the modern Cellar, combining traditional winemaking methods with technology, are one of the best reasons to visit the Herdade. 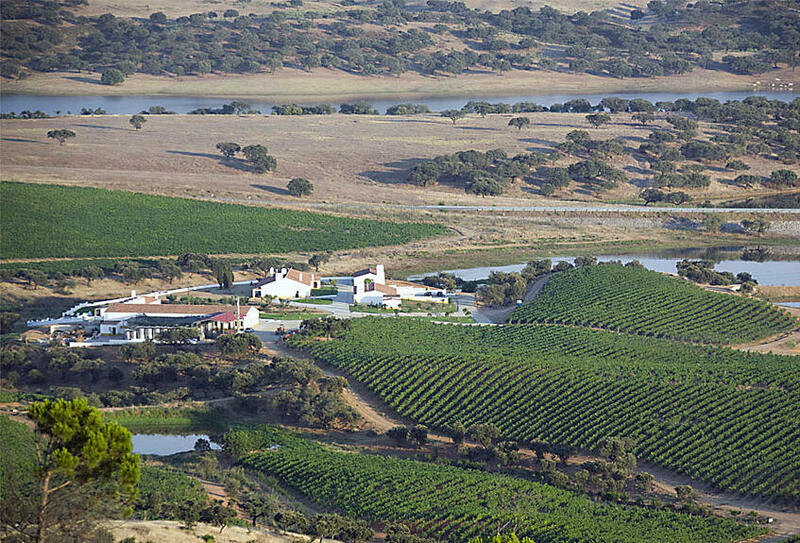 Herdade do Sobroso is placed in the county of Vidigueira and it's delimited by the mountain of Mendro at north, the river Guadiana at east, and south by immense plain as far as the eyes can see. To the lovers of wine tourism, Herdade do Sobroso offers a unit of Rural Tourism integrated into the middle of the property vines. The landscapes of the Alqueva dam, next to the Herdade, are magnificent and the roman ruins of São Cucufate are present you with a history lesson about the evolution of wine throughout the centuries. 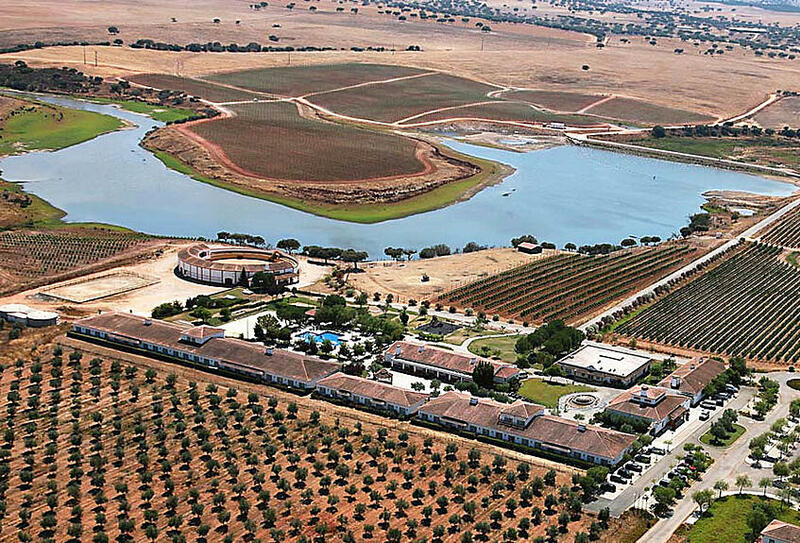 The Herdade dos Grous is located in the middle of the vineyards, olive groves, cork oaks and picturesque white villages in the heart of the Alentejo region. It provides fabulous gardens, an "infinity pool" with a stunning view of the artificial lake, the old olive groves, and orange trees laden with fruit that testify the fertile quality of this unique landscape. This is a place of pure relaxation, serenity, and remoteness from everyday life. 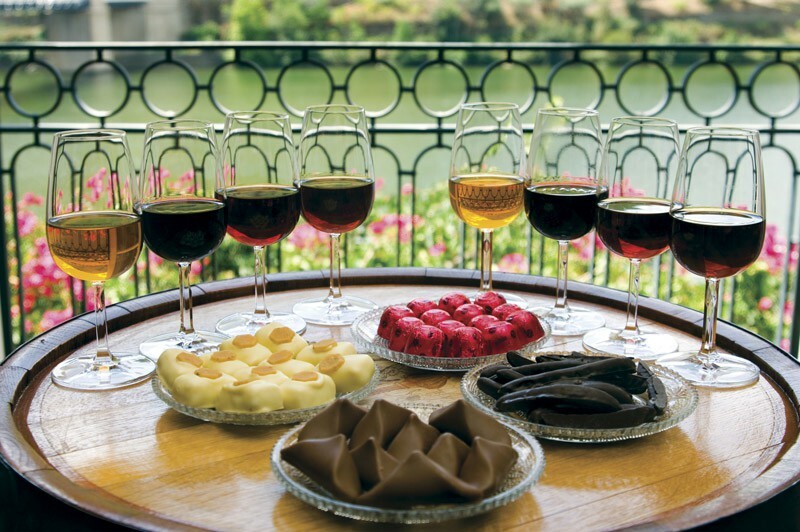 The Wine tourism is a major option of the Herdade in order to offer all wine lovers that wish for a deeper understanding of their signature wines. 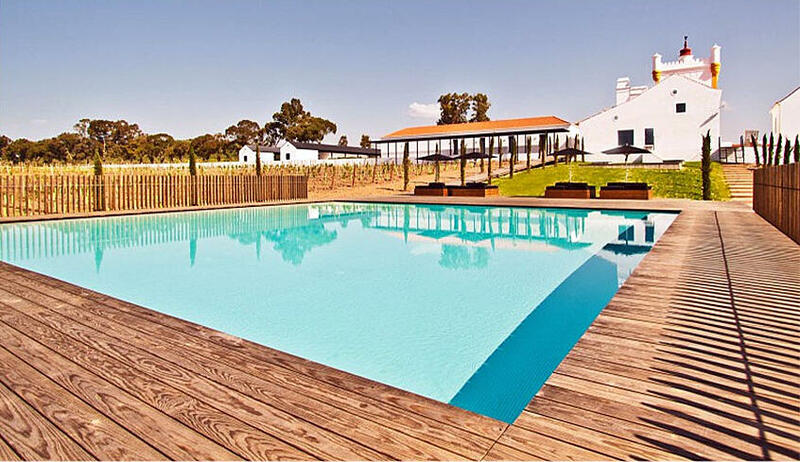 The Vila Gale Country Club combines the comfort of an Alentejo house with wine tourism promising unique experiences. It seeks to join in the same space a cozy, more traditional, intimate and familiar hotel, offering you the perfect place to carry out enotourism experiences. 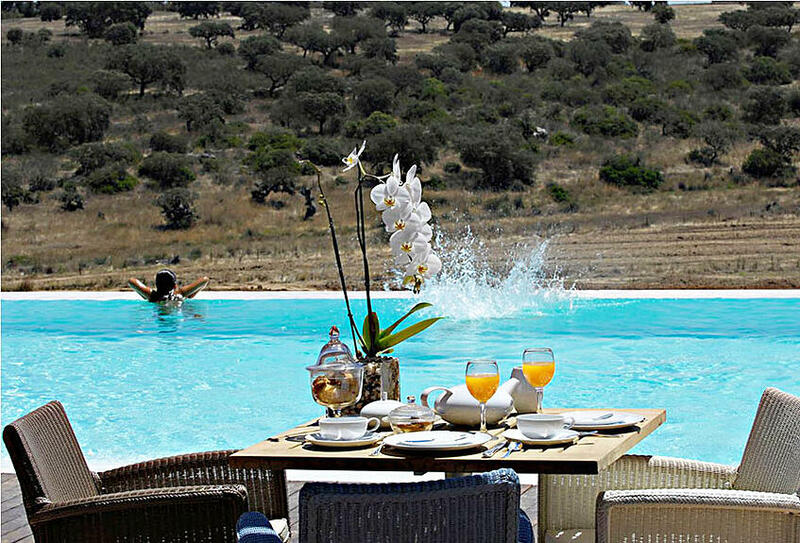 Strikingly of Alentejo inspiration, composed by whitewashed ground buildings with a yellow bar around, you will find the well-deserved peace to relax during your holidays. You'll have the opportunity to enjoy activities such as interacting with the farm animals and also to do excellent wine tastings. L’AND Vineyards is a "Wine Resort" that offers a unique rural experience in an exclusive and contemporary ambiance. 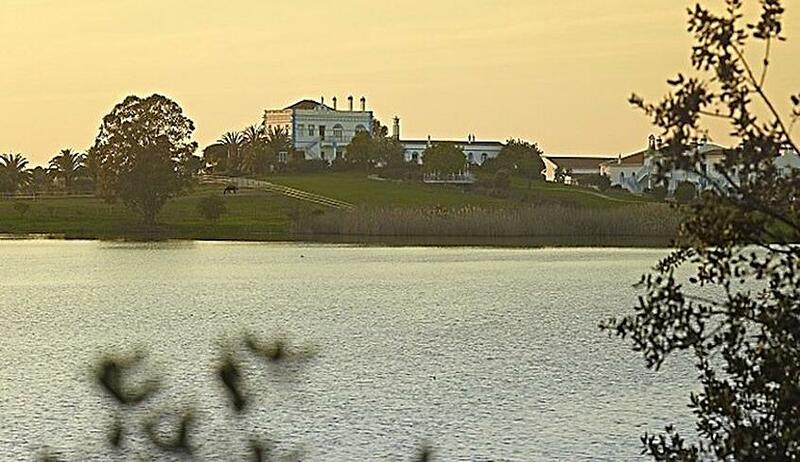 It is located in the heart of the Alentejo and extends around a central valley of vineyards, olive groves, and a lake. Its Sky View Suites allow the unique experience of sleeping "under the stars" by the full opening on the room ceiling, offering visitors the chance to observe the night sky. 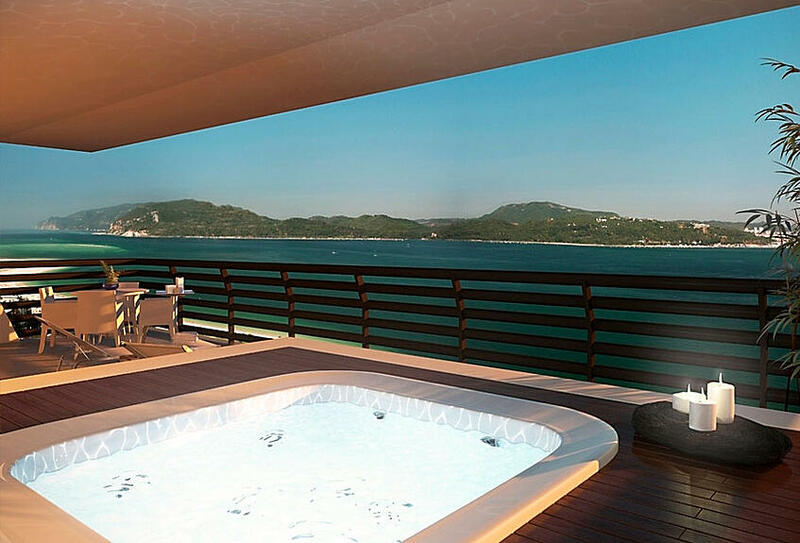 The villas have a private patio with a heated plunge pool. The interiors were designed by the architect Marcio Kogan and are made of slate natural stone and wood, ornamented with a set of art pieces and exclusive furniture and fabrics. 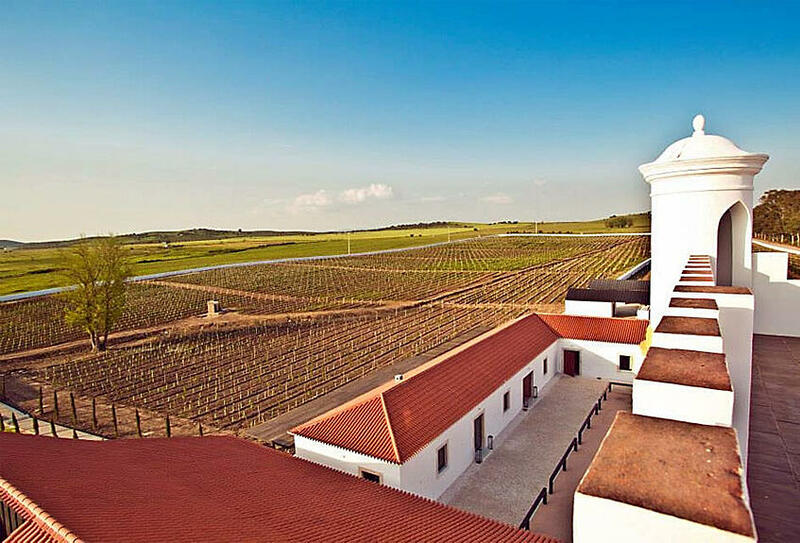 Located near the historical centre of Évora, World Heritage site by UNESCO, this is your starting point for the best wine experiences in the Alentejo region. The hotel arises from the adaptation of the old Sepúlveda Palace, a 16th-century building that has preserved a magnificent chapel, the vaulted ceilings and a set of three windows in Manuelino style (architectural style named after King Manuel) in the main façade. In a renovated manor house of the 14th century, Torre de Palma Wine Hotel has been luxuriously restored and features simple and sophisticated lines. Here, tradition merges with the audacity of modernity. 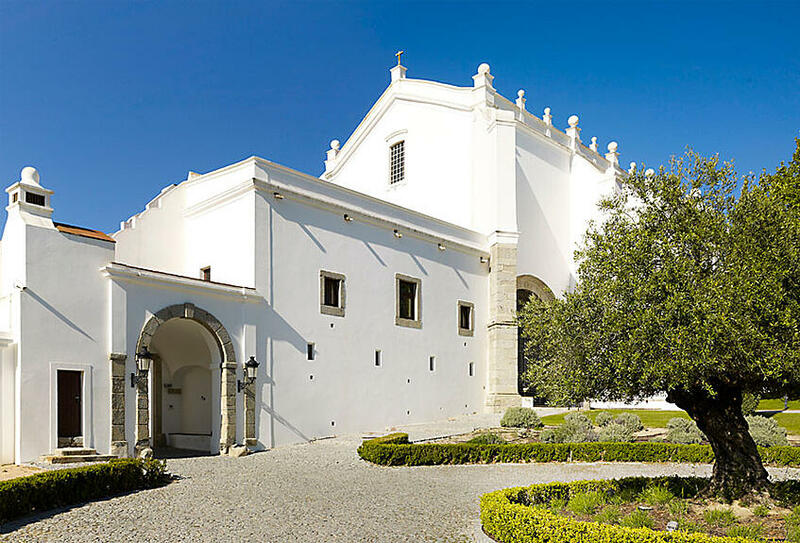 Inspired by the lifestyle of the distinguished Basilii family (the ancient inhabitants of the nearby Roman ruins of Torre de Palma) and by the Alentejo traditions, this hotel is more than just a hotel. The Palm Tower Wine Hotel has thematic rooms in different Alentejo houses, a rural loft, an old barn, and the manor house with the master suite. 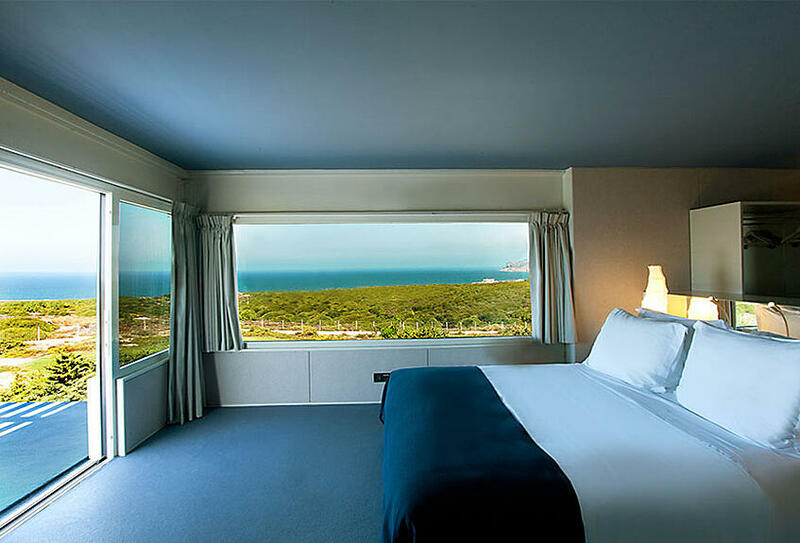 With the most beautiful beaches of the Coastal Alentejo, located on top of the Grândola mountains, Serenada Enotourism offers an unforgettable panoramic view of the Arrábida mountains, huge pine woods and cork oak forests extending to the horizon. At night, the Cabo Espichel lighthouse stands out. 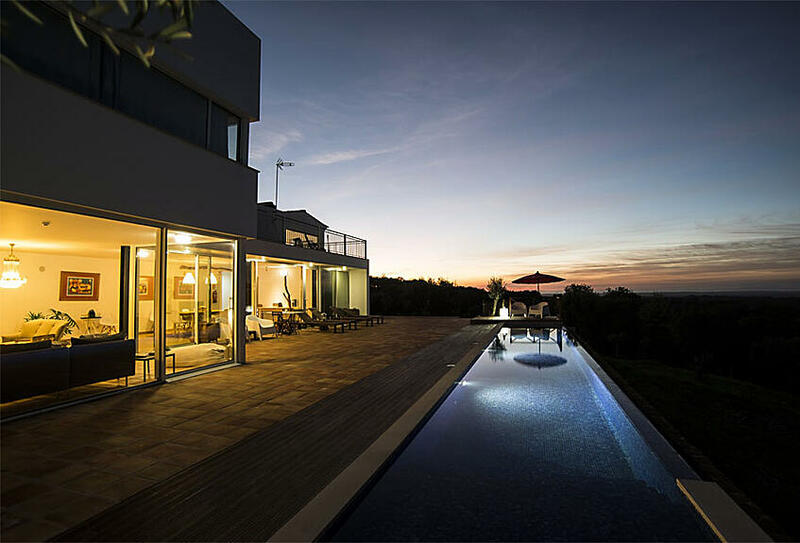 Midway between Lisbon and the Algarve, Serenada Enotourism has the perfect location. The property, where the wines Serras de Grândola are produced, has a fifty year's old vineyard, planted in 1961, a new vineyard of 2008, as well as cork and olive trees, some of them centenary, witnesses of the presence of the same family in these lands, with records dating from the 17th century. The wines are produced in the house cellar with the cooperation of the whole family. Guests and visitors can enjoy the tasting of the wines Serras de Grândola and Serras de Grândola Cepas Cinquentenárias (Fiftieth Grapevines). Located on an idyllic peninsula, Tróia Design Hotel is surrounded by the still waters of the Atlantic Ocean, by long white sandy beaches and golf courses. One hour from Lisbon Airport, this contemporary design resort is located next to the marina and is a privileged place for watching dolphins and white storks. It's situated in prime tourist destination due to the parks and natural reserves that surround this area. 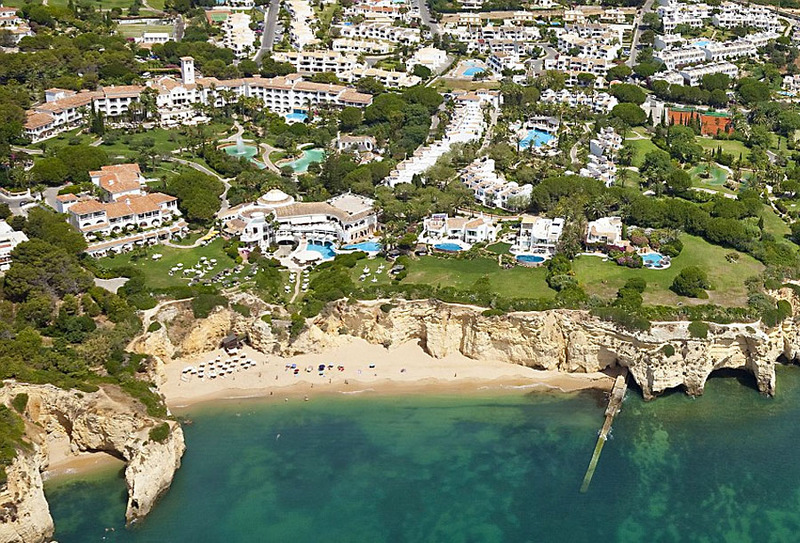 The VILA VITA Parc Resort & Spa is a Luxury resort, inspired by the Moorish architecture, located on the top of a cliff on the Algarve coast, in Alporchinhos/Porches. Surrounded by a magnificent subtropical park, this is a 5-star retreat that welcomes guests with a customized service and a true Portuguese hospitality, offering a whole world of experiences. The endless views over the horizon blend with the lush green colors of the gardens and the shimming blue of the Atlantic Ocean, revealing lively colors and filling the air with the sounds and scents of the sunny days spent at the beach. Like a good wine, the Hotel The Vine has a soul. 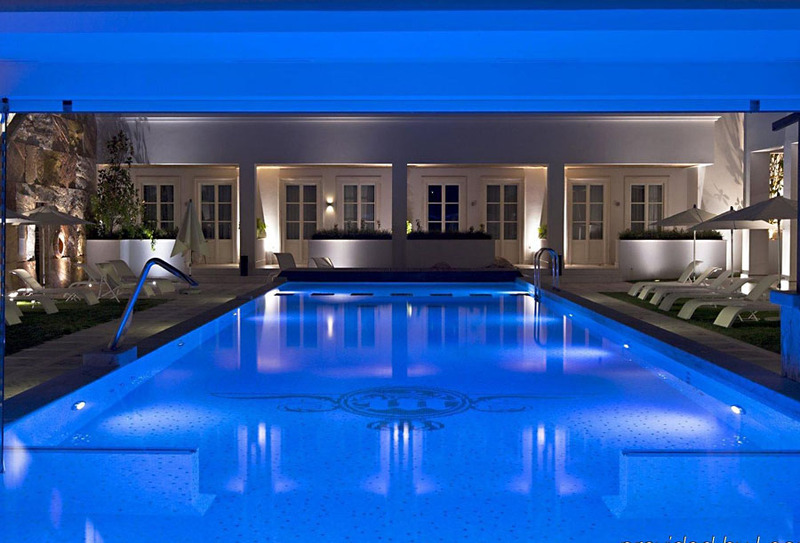 Built in 2008, this Boutique Hotel was distinguished with the "World's Leading Design Hotel" Award. 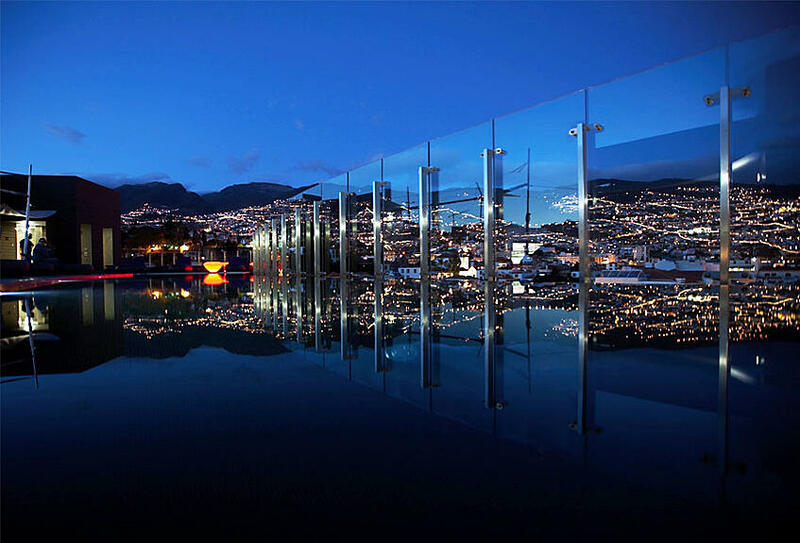 A dive in the 360º panoramic swimming pool, a Vinotherapy SPA session or tasting a gourmet dinner overlooking the city in its restaurant are some of the pleasures that will make your stay in this hotel memorable. 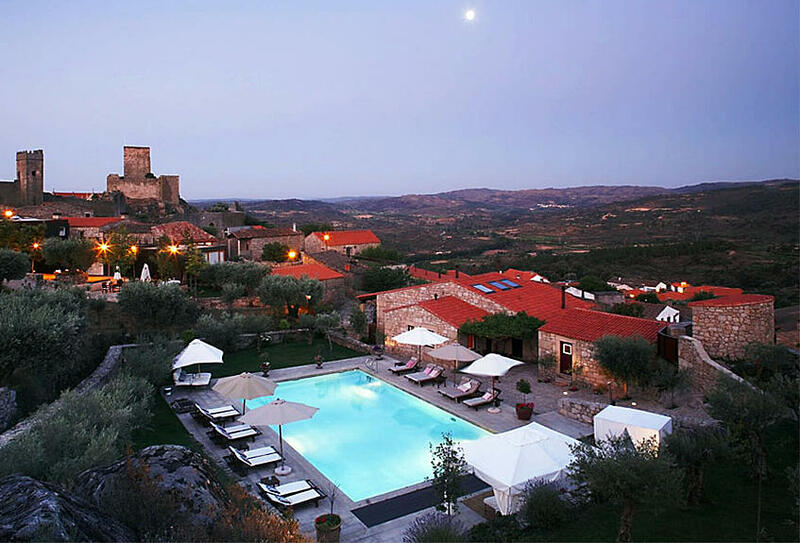 I hope this list of the best hotels in Portugal can contribute for an easy holiday planning. Another way to quickly access this list is by using a great tool at Wine Tourism in Portugal's website that allows you to sort out the best hotels in Portugal by wine region. You just click on the region on the map and the tool immediately presents you with the best hotels in that region.